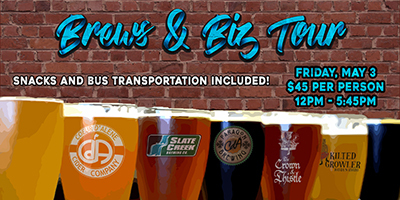 The Brews & Biz Tour is back! Tour six local breweries and get an inside look at how this niche market is contributing to our local economy. Taste local brews at each stop. Bus transportation and snacks included. 3:40pm Coeur d’Alene Cider: 1327 E. Sherman Ave.
4:45pm The Crown & Thistle: 107 N. 4th St.